We Are Your Gutter Resource! Most often the only time your thinking about gutters is when its raining outside, or when they become clogged with leaves and pine needles. With our service you can actually sit back and enjoy a rain storm. Learn about gutters and their benefits from our learning center, or go right to the source and request a free quote from a licensed contractor. Begin your free gutter protection estimate here! How do I keep out leaves and debris? 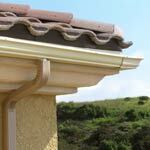 You may be interested in installing some form of gutter protection. Should I get a licensed contractor? Check out answers to this question and many more in our Commonly Asked Installation Questions. How do I get price quote? It's simple. Just use our Request a Quote Form.